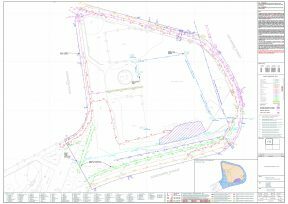 This is an example of a PAS128 compliant underground utility Type B detection survey using the TSA recommended template, colours and linestyles. This template will be available for download from the TSA website together with a CAD compatible linetype file. This template is fully PAS128 compliant and identifies areas of different search methodologies in addition to showing the results of the survey and detailing the methods used and some of their technical limitations. This drawing is shown at 1:200 scale, however if areas have denser concentrations of utilities present they would normally be shown at 1:100 or even 1:50. 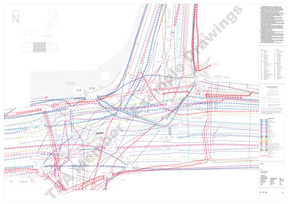 This is a typical underground survey of an urban/city road junction prior to PAS 128. However the detail shown would be similar possibly the colours and layer names may alter along with other definitions. This was part of a multi sheet survey. Commensurate to 1:50m plotting accuracies.